Denton is a music and movie lover’s town, and nothing expresses that as well as its events. Film festivals and massive outdoor jazz and blues concerts are among the many annual events in Denton. Yet that’s not all there is. Check out our calendar of the events in Denton so you don’t miss out. 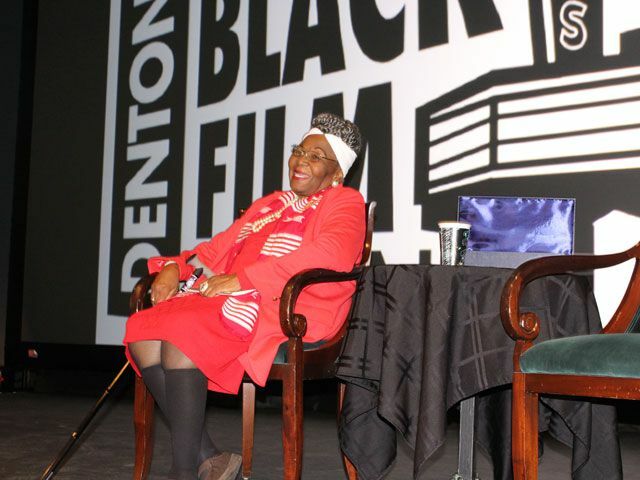 Enjoy three days of engaging and entertaining films and events inspired by the African-American experience at the Denton Black Film Festival. These films are often produced by local, national, and international filmmakers that are typically not featured in a major theatrical release. The festival also includes art exhibits, musical performances, and acting classes. During the five-day Thin Line Film Fest in mid-February, Denton becomes ground zero for world-class film, music, and photography. Concerts from internationally renowned musicians, screenings of documentaries, and cinematography workshops round out the festival’s list of activities. A full schedule and ticket purchases are available on the Thin Line Film Fest’s website. Denton resides within North Texas Horse Country, a region known for having one of the largest concentrations of horse farms in the United States. Many different breeds, including quarter horses, thoroughbreds, Arabians, and appaloosas, are reared here – along with world champions in cutting, halter, and other disciplines. Denton’s horse country can be explored on a behind-the-scenes guided tour of the region, held on one day in early March, April, and May. Tickets for the tours sell quickly, so reserve your spot as far in advance as possible. The Texas Storytelling Festival is a three-day tribute to truly remarkable tales. Listen to stories that will make you laugh, think, and leave you with a sense of wonder. Concerts from storytellers, workshops, and children’s activities are included in the festivities. Check the event’s website for a full schedule. Denton is practically synonymous with jazz, and nowhere is that more apparent than the Denton Art & Jazz Festival. This free event features performances by nearly 3,000 musicians on seven stages, as well as games and fine art, crafts, and food vendors. Listen to great music from local bands and browse dozens of stalls full of handmade products and gardening supplies at the Denton Redbud Festival, the town’s official Arbor Day celebration. Admission to the one-day event, held in late April, is free. High-flying stunts and world-class aerobatics are all part of the fun at the Denton Airshow, an annual event that showcases the stunning skills of some of top-class pilots. When you’re not taking in the captivating performances, enjoy an up-close look at a variety of historic aircraft that make up the air show’s static displays. The festival is held at the Denton Enterprise Airport in late June. The enticing smell of fried fair food, the sounds of carnival rides, and the exhilarating action of a rodeo can all be found at the North Texas State Fair & Rodeo in Denton. Concerts, livestock shows, contests, special exhibits, and rodeo events like bull riding and calf roping make up this nine-day annual event, held at the end of August. 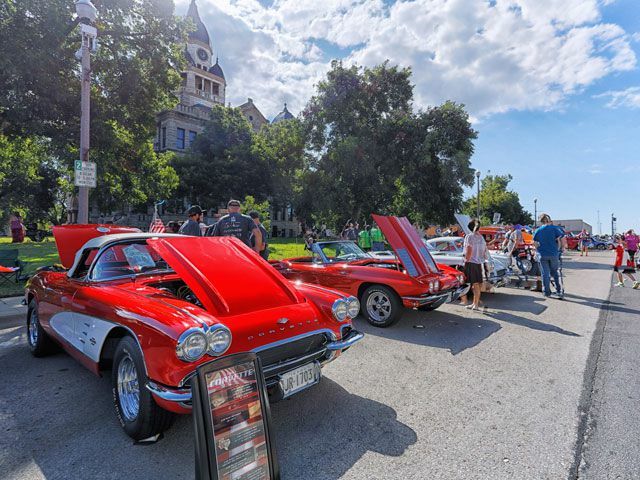 Gorgeous Historic Downtown Denton provides a remarkable backdrop for the Arts & Autos Extravaganza. During the one-day event, the square is turned into an outdoor gallery of beautiful classic cars, hot rods, and motorcycles. Fine arts and crafts vendors, antique sales and appraisals, tasty food, a chalk art exhibition, and concerts are among the many things you’ll see at the extravaganza. Dog Days of Denton is a celebration of man’s lovable best friend. Take your pooch to a full day festivities, such as a canine couture costume contest, live music, contests, and arts and crafts vendors. Demonstrations and performances by dogs (and their trainers), ranging from pet tricks to an agility course, helps make this event a tail wagging good time. If you enjoy the soulful tunes of B.B. King or Muddy Waters, then you can’t miss the Denton Blues Festival. 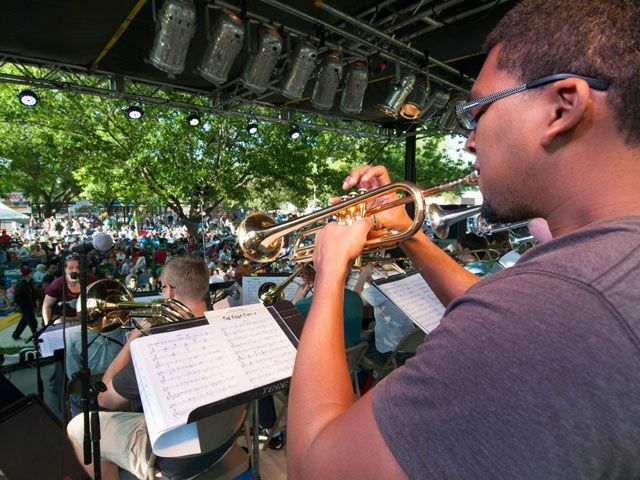 Revel in two days of outstanding performances by professional and amateur musicians while you lounge on the grass in Quakertown Park. The free festival, held during the third weekend of September, includes arts and crafts booths, and food and drink vendors. Denton celebrates Dia de los Muertos, Halloween, and the dawn of the fall season at its own Day of the Dead festival. The event, held in late October, features such family-friendly activities as a salsa tasting competition, twilight lantern parade through downtown, and the always popular coffin races. The University of North Texas’ One O’Clock Lab Band is a world-renowned jazz group that has been nominated for seven Grammy awards throughout its distinguished history. Every fall, the band welcomes a guest performer to play with the group – an event known as the One O’Clock Lab Band Fall Concert, held at the Murchison Performing Arts Center in late November. Tickets for the concert are available through the Murchison Performing Arts Center’s website. 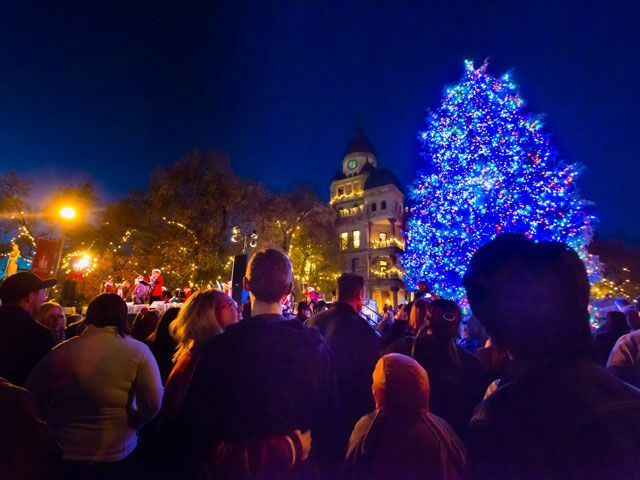 Ring in the holiday season in style at the Holiday Lighting Festival of Denton. Live music performances by local bands at numerous venues in the downtown area, including at the Bayless-Selby House Museum and the St. Andrew Presbyterian Church, accompany the lighting ceremony. The Wassail Fest, in which several downtown vendors make their own wassail and give away samples for free as part of a contest, accompanies the holiday lighting festivities. Photo ops with Santa, horse-drawn wagon rides, and food from local vendors are just a few of the other things included in this cherished annual event.